A Mother's Voice tells the story of one woman's journey from willful innocence to horrified experience in a fictitious South American state. It deals with the subject of Los Desaparecidos - "the disappeared". It is a powerful and hypnotic piece incorporating physical theatre and dance alongside more conventional performance. It was originally written as a performance piece for final year students following the BTEC National Diploma in Performing Arts course. It was developed over a period of just three weeks. Having decided on the central theme in the first week we workshoped all sorts of ideas together. We included physical work, character creation and movement exercises. In the evenings I would go home and begin exploring the same ideas in script form. 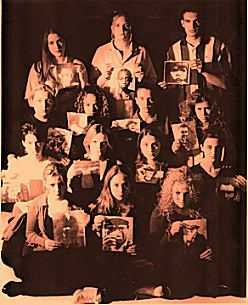 Final Year students from Amersham and Wycombe College holding photographs of Los Desaparecidos - the disappeared. In the second week we began to shape and form the play still further whilst rehearsing scenes we had now written out. About half way through this second week we had a full script - all that was left was to rehearse and perfect this for performance! In the third week we presented four performances of what had now become "A Mother's Voice".Working in this intense fashion produced a remarkably powerful performance that moved and affected all who saw it. Many left the theatre in tears. It was a remarkable experience for all concerned. The process of rehearsal produced a real sense of engagement and involvement from the students and many found a depth to their performances that they had not tapped before. It was a great way for them to finish their course. Of all my plays, A Mother's Voice, is the one that I am most pleased with to date. It does, however, require more than a simple translation of the script from page to stage in order to make it work. As a final performance piece I had to ensure there were opportunities for students to explore their "specialisms". Therefore, aswell as characters to develop, there are many opportunities for movement, music and dance along the way. On the page the script can look a little stark - it is only through performance that the full richness of it can be discovered. The expression is poetic at times and the action moves from the realistic to the surreal. The characters are emblematic rather than fully rounded - though the performance of the central characters requires considerable commitment and understanding if the emotional core of the piece is to be exposed. There are some terrific theatrical moments in the piece - such as the bringing in a the father's body held high above the heads of the crowd; Constantia's dreams of the land of the dead; Baptista and Ernesto discovering each other as the washing lines lift to become the flags at the festival and the search of the mother for her missing daughter mirrored by scenes of what her daughter is enduring. And yes - even in all this - there is still room for comedy in the gossiping of the villagers and the taunting of the local heart throb by the more knowing factory girls! A Mother's Voice can be set anywhere in the world but was originally written against a quasi central/south American background. The breathy Andean pipe music certainly added to the haunting quality of the piece.